Most homeowners spend their free time in gardening in their properties. Some of them even earn a livelihood out of their harvest. Now, if you are one of the homeowners who want to take gardening seriously, you might want to invest a grow tent for indoor plant growing. For this post, we are going to review the top 10 best grow tents for indoor plant growing. We’ve created a list just for you to ensure that you make the right decision. 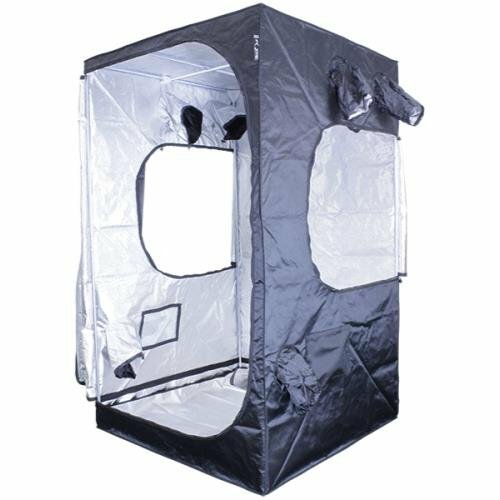 The following are the most durable, innovative, and easy-to-use grow tents that are available in the market today. First on the list is the Gorilla Grow Tent that will allow you to create an indoor growing environment in the comfort of your own house. This indoor greenhouse is intended for a variety of plants. It’s made of high-quality material and 100% steel interlocking frame. The manufacturer is also known to feature the best zippers in the industry nowadays. It features an EZ view windows that provide increased visibility of your growing plants. This expertly-designed tent is the best solution for customers who are keen on quality and durability of the product. You can even double your yield next year thanks to this height adjusting growing tent. It has doorways and wraparound zippers to offer 360-degree convenient access to you. The tent is made of durable canvas that is bound to last for a long time. 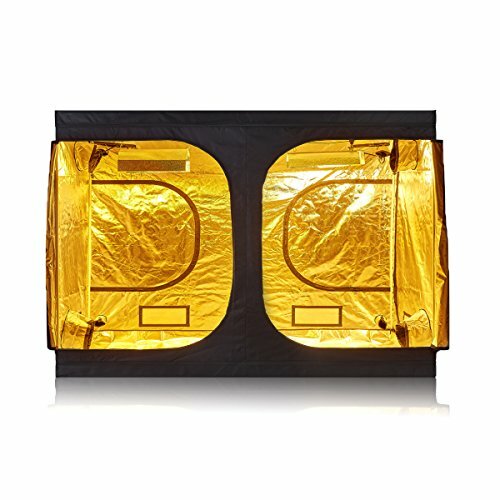 Check out this grow tents from iPower. It helps you to save energy in the long run with its tear-proof over 95% reflective and 99% sealed light proof mylar with double stitching and heavy-duty zippers. It’s sturdy and reliable heavy-duty metal poles rated can handle up to 110 pounds, and it also comes with reliable metal corners. Now you can easily organize and observe your growing plants with its easy-view window sealed with transparent plastic. 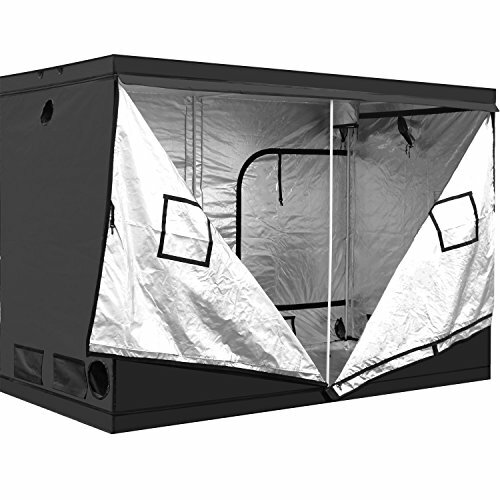 The removable covers will allow you to view your plant and check its condition without having to step inside the tent. The package comes with a tool bag for your gardening and accessory tools. 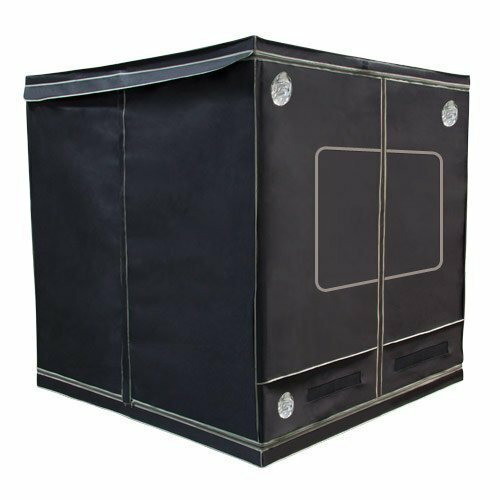 This tent will keep the plant area clean and fresh thanks to its removable water-resistant mylar floor tray with security straps that can secure the spill tray to the frame. You can also remove the heat from your plant thanks to its double layer ventilation ducting holes and bottom ventilation windows with removable cover. The installation is easy and requires no tools at all. Buyers can enjoy up to one-year limited warranty upon purchasing the product. 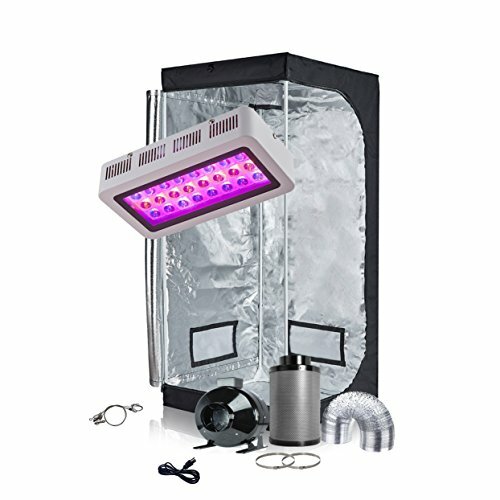 This growing tent from TopoGrow is also a significant investment as it features an LED 300W grow light and two cooling fans to provide optimal control of temperature and lightning. The user-friendly full spectrum design will allow you to grow your plants in a full growth cycle. We also like its 96% highly-reflective waterproof diamond Mylar that can last for a long time with proper use and maintenance. The tent is made of 600D lightproof oxford cloth with white paint-coated metal rods and plastic corners. The four-inch fan and filter are also included with double layer duct. This tent is designed to suit the stages of plant growth. Similar to the previous product we’ve reviewed, it also features a user-friendly full-spectrum design to grow your plants properly. 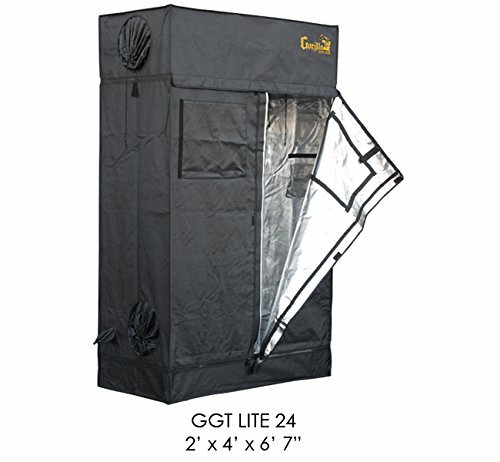 Gorilla Grow Tent GGTLL24 Tent, 2' x 4' x 6'7"
If you liked the previous product we’ve reviewed from Gorilla Grow Tent, you might want to check out this all-new product from the same manufacturer. Similar to the previous product, it features a height-adjusting system with the patent pending adjustable extension poles that allows you to increase the height of your grow tent. It is made of dependable and durable canvas to protect your plants and can last for a long time. The solid metal interlocking frame is designed to provide exceptional stability and avoid wobbling issues. It is also a bug-resistant adjustable micro mesh pre-filters to protect your growing plants inside. There is a viewing window, so you don’t need to step inside the tent, an all-steel interlocking and secure frame in addition to tightly reinforced seals. The zippers are durable and designed for heavy-duty use. This tent is made of durable fabric that can last for a long time with proper use and maintenance. Another product from TopoGrow that we’re going to review is this indoor grow tent room to help you achieve indoor gardening success. The tent cover is made of 96% highly-reflective waterproof diamond Mylar. The frame’s diameter is 19mm with white paint coated metal rod. This tent is durable and can serve you for years to come thanks to its heavy-duty 600D lightproof oxford cloth and heavy-duty zippers that can prevent light leaks. To improve air circulation inside, the round vents with mesh and multiple vents for fan and filter output are also installed. The floor tray is waterproof and removable, allowing you to clean the tent with ease. The connector material is 19MM white paint coated metal rods for greater stability. You can also use the nylon belts for filter straps. This tent requires minimal assembly that does not require any tools at all upon arrival, and it’s ready to use. This sleek-looking grow tent is from Virtual Sun. It is made of heavy-duty 600D oxford cloth that secures your plants inside. The inner lining material is made of 100% highly reflective waterproof Mylar to ensure minimal light escapes. To provide high stability, the frame material is made of firm powder coated metal. There is a removable reflective floor pan and integrated large door for setting the lighting systems and transferring the plants in and out. The integrated zippers also allow you to set up and take down the tent in just a few minutes. This tool-free assembly adds to its efficiency along with removable roof cross members. In that way, you can adjust the lights and accessories accordingly. The sturdy metal rods with connectors ensures you that this tent is easy to move once constructed. This grows tent from TopoLite provides a longer lifespan compared to other products we’ve reviewed so far. The light won’t generate excess heat even if it works up to 18 hours per day. In that way, you can enjoy a longer service life of your lighting. Similar to other tents we’ve reviewed, it also features a user-friendly full-spectrum design that will allow you to grow your plants with ease. The material used for this tent is the heavy-duty 600D lightproof oxford cloth and diameter 16mm white paint coated metal rods. Thanks to its double stitching, rest assured that the light wouldn’t seep inside the tent. It also features a large heavy-duty zipper with no puncture holes. The rectangle vents with mesh promote enhanced air circulation inside and the multiple vents outside is intended for fan and filter output. You can use the two nylon belts included in the package as filter straps. 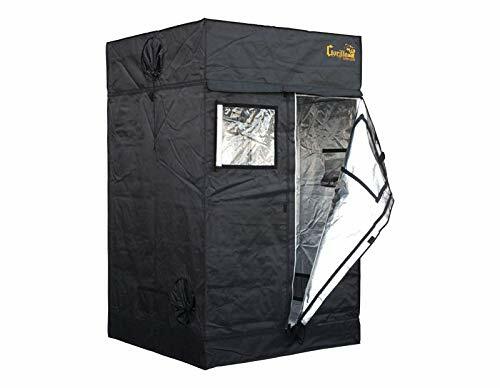 Another product that we’re going to feature from the Gorilla Grow Tent because of its extreme durability that features a 100% metal interlocking frame and connectors. In that way, you can enjoy the great stability of your grow tent. It also features infrared blocking roof insertion and easy access tool pouch to increase your productivity while planting. 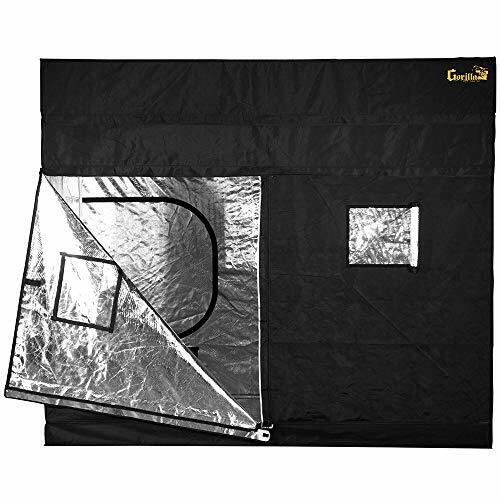 This tent is designed for both beginners and professionals in gardening. Thanks to its innovative technology that can hold up to 300 pounds, you can double your yield and enjoy fresher and bigger vegetables at the end of the season. It has a 360-degree doorway that frees you from the frustration of maneuvering to have a hassle-free setting up of the lighting system and planting. 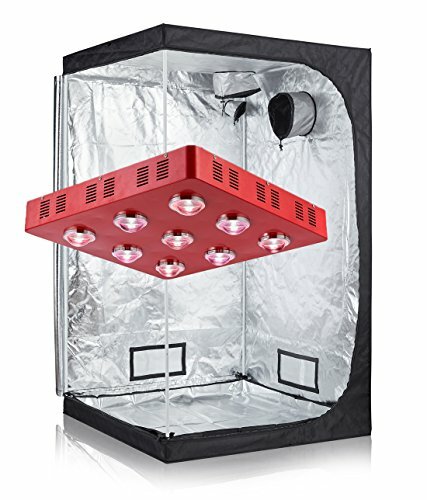 You might want to check this indoor grow tent room from TopoLite that features a 96% highly reflective waterproof diamond Mylar to improve the reflective effect. It has rectangle vents with mesh to promote good air circulation, and the multiple vents are designed for filter and fan output. Since it’s made of heavy-duty 600D lightproof oxford cloth and diameter 16MM white paint coated metal rods, rest assured that it can last for a long time with proper use and maintenance. Similar to other products produced by the same manufacturer, it also has large heavy-duty zippers and double stitching for protection against light leaks. The installation requires no tools at all. In just a few minutes, you can have it erected inside your house and ready to use for planting. Lastly, we have the hut blackout from SunHut. 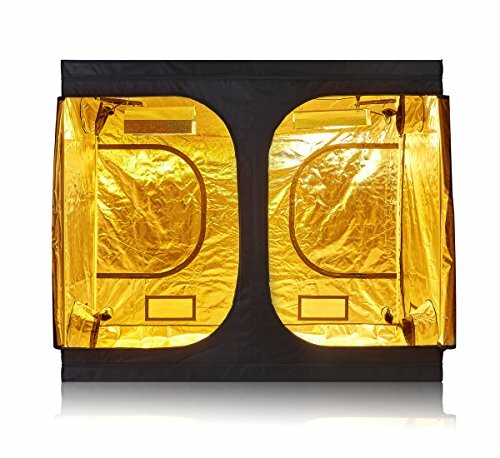 This grow tent is one of the newest launched products in their Pro Grade grow tents that will help you to achieve success in gardening. It offers the most complete and diverse selection of tent sizes compared to other manufacturers with sizes and configurations available. The material for this tent is 210D light tight with the highly reflective interior surface. This is intended for customers on a tight budget but still wanted to achieve indoor gardening success. Thanks to its heavy-duty galvanized steel poles, rest assured that it will not wobble once constructed. We also like its improved ventilation featuring the micro-mesh ventilation windows.